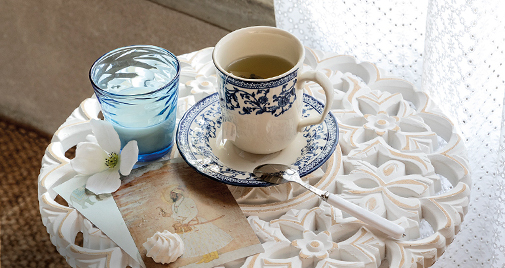 Dress the house with new and bright colors that give joy and the air of good season. 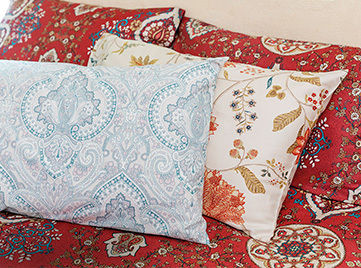 Embroidered cushions with cheerful tassels and linen in watercolor colors in soft cotton percale or yarn dyed. The bed linen in cotton satin gives soft elegance and bright colors. 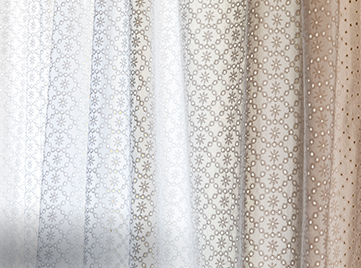 The cotton sangallo curtain adds notes of refined freshness. The bathroom tells about the pleasure of wellness. For the body and the mind. Orange and green together to give balance. Orange is the dawn of the new day, the color of joy. Help to understand yourself and your emotions. Green is a tribute to nature, its regenerating power and detox. HOLI FESTIVAL, the Indian Festival of colours, is the inspiration for the new season’s collection. It is a spring festival dedicated to fun, where it is customary for people to throw coloured powders over each other, in tribute to rebirth and spring with its new colours. 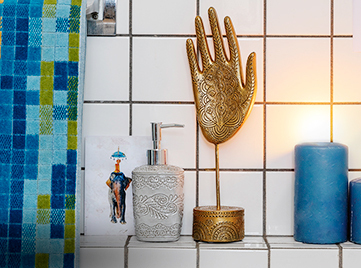 Traditional Indian iconography, precision outlines and bright colours are the leitmotiv of these new ideas: joyous, exuberant and anything but traditional items, enhanced by hints of mix & fusion together with a “vintage” feel to add a contemporary character. Prices discounted by 50% make it even easier for you to give into the temptation to give a whole new look to your home for the new season. The Coincasa collection dedicated to household linens is multi-coloured and multi-form, transmitting fun and heralding the end of winter and the start of spring. 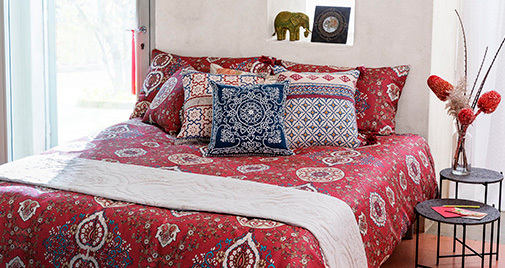 The patterned fabrics, together with the techniques used to create them are a contemporary interpretation of Indian traditions: stylised designs, reminiscent of mandalas or henna decorations, are alternated with monochrome prints and classic redesigned cashmere, painted with watercolours, on their own or with soft flowers. Patterns prevail: multi-colour and monochrome play with typically Indian-style brights or elegant new design variations, with a dominant palette of dusty sky blues and natural shades. Soft furnishings have a wealth of embroidery, stitching and appliqué designs, typical of eastern workmanship. The many decorations include a focus on the elephant, symbolising strength and love for the family. 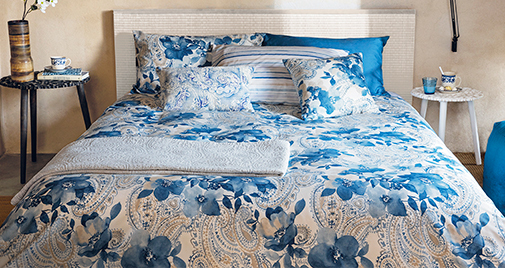 Bed linen sets are on offer at extremely special prices, especially when it comes to the quality: sets consisting of duvet covers or top sheet and pillow cases, are in cotton percale or cotton satin; solid colour bedlinen sets in satin also include fitted sheets and large king size for maxi beds, as well as standard sizes. The palette starts with darker shades, closer to the theme of winter, like claret and deep blue, then it passes to more delicate tones, with watercolour designs on blue or pink, through to spicy colours in typically Indian designs. 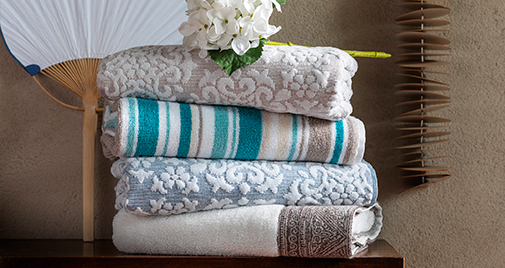 More than just solid colours and jacquard designs for these special offer bathrobes and towels: the range include terry with broderie anglaise inserts or with colourful stripes or checks, like the mosaics found on bathroom tiles. Bathrobes are available in four sizes, from S through to XL to suit all needs. 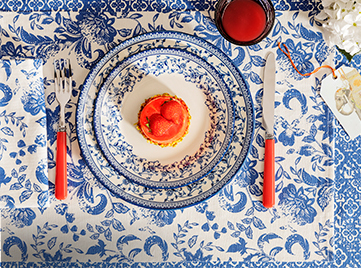 The new tableware collection opens up to spring with blossoming colours and patterns for table cloths, napkins, table mats, and aprons, but also on dinner services, with matching glassware, cutlery and a wealth of colourful accessories for the table rich with style. Choose from the different stories, from the most elegant, delicate pastels that are perfect for lunch settings, through to the more colourful, fun and multicoloured patterns for everyday use, with a wide variety of designs inspired by the traditions of India. And there is no shortage of full ranges of table cloths and mats for different sizes of tables, including round or oval. Fabrics to decorate your living room with curtains, cushions, throws and rugs with rich effects thanks to so many manufacturing techniques, embroidery and appliqué designs. The new season sees an increase in the range of baskets, laundry baskets, small units and drawer units, including variations with coloured pompoms and surprising details, and grey and white units with ceramic knobs to make these special offers, not to be missed.